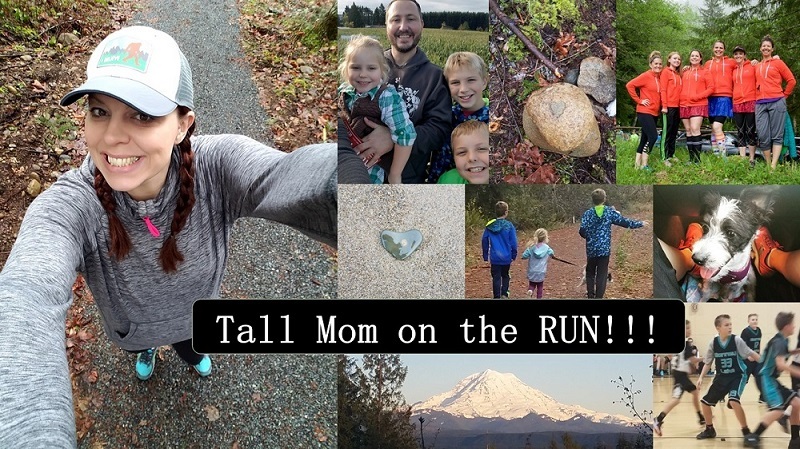 Tall Mom on the RUN: Thank you Nathan Sports! "We're happy to share our products with athletes, we believe that if we can create a true Nathan fanatic, and thereby a hydration product believer, we help out everyone involved. I look forward to reading the review on your blog. " How AMAZING is that? I am so pumped. Living on one income (hubby stays home with our 2 boys) it is tough to find the extra cash to pay for my hobby/habit/sport/addiction….then wonderful companies like this step up and make it happen. I can hardly wait for the Speed 2 to arrive. Thanks to Ellen, Penguin and Nathan, huge thumbs up in my book!!! Product review to come soon.. Check out the Nathan website link above, they have some great products!! I am in LOVE with the ladybug and pink ribbon bottles...hmmmm..maybe a birthday gift for myself? What a great choice instead of using plastic bottles..
HA! I LOVE my Nathan bottle. I have the green recycle bottle, drinking out of it right now! I use it every single day. My husband has the black one to match mine... we are dorks. But environmentally friendly dorks (plus i am VERY anti-plastic) in fact I have a new series of posts i'm going to do on things I heart, this is one of them i have planned. And how does everyone get so much free stuff??!!! HA! I was just thinking "hey, I saw that same bottle this morning in Fair Weather Runner's husband's office!" (we work together). Too funny. I have a Nathan single-bottle belt, I really like it although I don't typically carry it unless I'm going a long ways without access to water. Looking forward to your review of the belt! Looking forward to your review...I have a Nathan pack with the one larger bottle and I'm not in love with it because I can't get it to lay right on the small of my back - it bounces and the zip compartment only holds like one gel and it's awakward to reach behind to unzip. However, it is a NICE pack, well-made and the bottle itself is awesome, but it bounces too much. I think the two bottles would lay better for me. Good for you!! 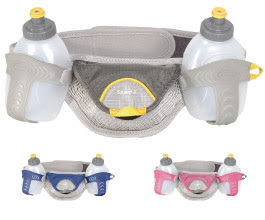 You were looking for a hydration belt... and now you have one. For free! nice job with the belt -- make sure you tell us how they work for ya! those bottles are cute too! Can't wait to hear what it's like. I can't imagine what it's like with a belt. I've never had to run so far that I've needed one and hate running with keys! that is so awesome! thats the one i use and <3 it! That is so amazing Mel!! I have a Nathan fanny pack(don't know what else to call it). I love it. Can't wait to hear if you love the pack with bottles.